With a giver motivated husband, it is easy to see how that motivation can make it difficult to receive. My motivations for giving are at times somewhat less pure, wanting to be noticed maybe, or doing the right thing. Motivations not rising out of a place of love can cause guilt and condemnation when on the receiving end of a pure gift from someone else. I have learned, and am learning still, as I watch him giving of himself over and over and over, that when the tables are turned it is a bit difficult to for him to receive offerings from others. Over the years I have encouraged him to just “Smile and say thank you.” He is becoming much better at it, and can even do it sometimes without being prodded. I then find myself repeating these same instructions in my head quietly to myself. It is a joy to behold, this learning and growing process, the one where Holy Spirit speaks and we listen. What a great example for our grandchildren, who need clear role models in a generation of caring for all the wrong things. The biggest issue I suppose is that when we are gifted something, feelings of unworthiness rise up on the inside of us. The truth of the matter is that we ARE worthy, not in our own strength, but in Gods strength. Christ in you, the hope of glory. Colossians 1:27. It is Christ in us that makes us worthy. He gives lavishly, we receive His gift. It helps us to recognize Him for who He is, the Giver of all good gifts. 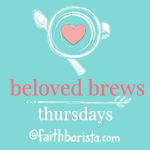 Beloved Brews Thursday writers link up.